I'm a little late on this track. About 148 years late. I think this guy's label needs to beef up its promotions. This is the earliest known recording of voice made by Parisian inventor Edouard-Leon Scott de Martinville (I want a cool long French name). The recording itself is not much. It is a recording of someone singing an excerpt from the French folk song "Au Clair de la Lune". I can barely tell it is human. A historian quote in the MSNBC article appropriately describes it "like a ghost singing to you". Ca-reepy. But amazing none the less. The article describes how it was done. The recording was made 17 years before Edison invented the phonograph. Scott has experiments going back a few years but this was the first recording with recognizable results. 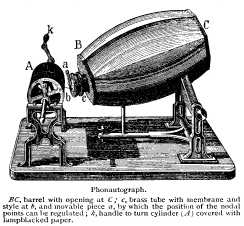 The picture above is the device he created to record the sound, a phonautograph. It takes "photos" of sounds. It was originally never intended for playback, it was just to create a visible interpretation of sound. Seriously you can't get more off the radar than this.